“Your flowery description’s no better than his! We sent for the great light and you bring us this? What do you think about this song? What do you think it’s about? This entry was posted in Life, Thoughts on November 22, 2009 by Andrew. This entry was posted in Photos, Thoughts on November 17, 2009 by Andrew. 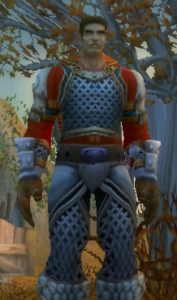 He’s a level 14 Human Warrior in World of Warcraft . He’s played by me. That’s right, I now play World of Warcraft. No, I’m not addicted to the “warcrack” or am large, overweight, pimpled-face man living in his parent’s basement. That’s just silly, cause my parents don’t have a basement. Anyway, I’ve heard about this game for a while (it’s been launched for 5 years now) and I’ve always wondered what it’s like. I mean, there’s a 11 million people playing (and paying monthly) this game, there’s got to be something people find entertaining and worthwhile in it. So I signed up for the 10 day trial and gave it a shot. Needless to say, I lasted about a 5 days before I bought the game. And the first expansion. And the strategy guides for both the core game and the expansion. Okay, that’s kind of stretch of the truth. It was all in one box and was the cheapest option from Amazon. (Side note: the one-day shipping from Amazon is something amazing. It’s worth it’s own post. It’s that cool). Find someone who has a quest. The quest can be simple as go talk to this person (usually quite a ways away), or kill this many monsters, or pick up this many things the monsters sometimes drop, or something completely different that I can’t think of right now. Combat is fairly simple. It’s not a “hack-n-slash” type of game where you control each swing of your blade and each block of your shield, but it’s more of a point and click kind of game. You walk up to the monster and right click on it and you’ll just start hitting it with your sword. Damage is based on number crunching, like old school Dungeons and Dragons, but you do get to control when your special attacks are used. These are the fun part and bring out the strategy of the game. Like managing your energy level and choosing whether to hit the monster with a stronger attack or boost your health to take more damage. The other part that makes World of Warcraft popular is the fact that it’s a MMORPG (lofmalow﻿!!!1!! [link]). A MMORPG stands for Massively Multiplayer Online Role Playing Game. And I’m pretty sure that acronym set the tone for the rest of the game acronyming everything else. So you are not playing this game by yourself, you are not just playing with your friends, you are playing with strangers. Who for the most part ignore you, but sometimes are really useful and have saved my “life” a few times. And sometimes they’ll hang out with you and help you complete your quests, and you’ll help them complete theirs. It’s surprisingly fun. Lindsey even enjoyed the time that we played together. Not enough to buy it, but enough that she didn’t cry and scream “No, no! I don’t want to play that game! Please don’t make me play that game, you’re so mean if you make me play that game” when I suggested we spent another evening tele-dating over the game. And the other thing I’ve noticed is that LFG is much funnier now that I know what it’s making fun of. And that’s that. Comments? Questions? Just leave them below. This entry was posted in Life on November 12, 2009 by Andrew. Elephants. If you were there, you might think this was a video. Cause they did NOTHING! Except eat a chain. That was weird. A monitor lizard! She was feeding it, and making it walk all over. It was funny. Flying foxes. I think my favorite part was (is) the teddy bear. It’s some how both morbid and cute at the same time. Turtle. Turtle, turtle. Am I not turtlely enough for the Turtle Club? A Chilean Rose tarantula. Scary, but not as scary as Tarantism. This entry was posted in Life, Photos, Travels on November 2, 2009 by Andrew.